PARIS, France (CNN) -- French President Nicolas Sarkozy became faint while jogging late Sunday morning and was taken to a hospital, the presidential office said. 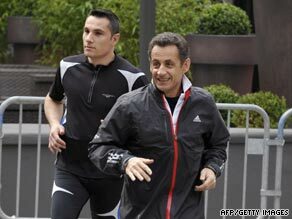 French President Nicolas Sarkozy is often seen jogging with bodyguards. He did not lose consciousness, and initial tests showed nothing abnormal, said a statement released by the president's office. His heart will be monitored until Monday morning, which is standard procedure in such cases, the statement said. In the meantime, according to the statement, he is resting and keeping in touch with his advisers. No further announcement was expected until morning, the statement said.